With a big front-page headline titled "Entire Florence Bronze Casting for Macedonia", daily Dnevnik of 4 May informed its readership that it has come in possession of the secret contracts between the Municipality of Centar (unit in the City of Skopje) and the Fonderia Artistica Ferdinando Marinelli from Florence, for the production of a series of monuments in total value of around 10 million Euros. 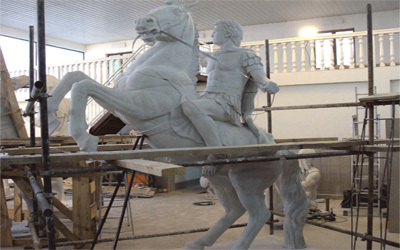 The biggest of the monuments being produced in Florence is that of Alexander the Great on his horse Bucephalus, which will be about 22 meters high, and which should arrive on the Skopje central square by October 2010 the latest. The news of the actual amount being spent on monuments amidst an economic crisis added heat to the ongoing debate concerning the government's plans for cultural "renaissance" of the center of the capital. In addition to Alexander who is at the core of the controversy, the famous Florentine foundry, together with two sister companies is working on several other monuments including Dame Gruev, Goce Delcev, and Nikola Karev, all Macedonian revolutionaries from the late 19th and early 20th century, and 2 pairs of lions which should be placed on the two ends of the Goce Delcev bridge in the center of Skopje. The lions, according to Dnevnik, cost around 1,2 million Euros per pair, whereas the revolutionaries from the Ottoman period, all of them riding horses, should cost around 0, 8 million per piece. The biggest item is naturally the gigantic Alexander which should cost around 4, 5 million. The contracts obtained by Dnevnik were "secret" because over the past months both the local and the central government refused to give any information about the cost of the project or the exact location where the monuments were built. According to Dnevnik, the contracts also contain provisions that neither party should reveal any information about its subject. Ever since the news of the plans to have grand sculpture of Alexander at Skopje's main square was first broken by the press a couple of months ago, the project has been polarizing the Macedonian public. The colossal monument is the crown jewel of the government policy of so-called "antiquisation" - accentuation of the ancient roots of Macedonian identity at the expense of minimization of the importance of the Slavic substance traditionally considered the main ingredient of who Macedonians are. Whereas many people in the country feel Slav, there are many others who have come to like the idea, first promoted in the early 90s, after the independence, that their origins might actually derive from antiquity. The issue was one of the hottest in the recent presidential and local elections which ruling VMRO of Prime Minister Nikola Gruevski won convincingly. This can be taken as an indicator of the acceptance of the antiquisation project by the people, given that VMRO is its major promoter. Once it has become clear that the media have finally got hold of the full information concerning the monuments, the new VMRO seconded mayor of the Municipality of Centar, Vladimir Todorovic, who originally refused to comment for Dnevnik's article, held a press conference today in order to respond to the "huge pressure by the public". Todorovic tried to explain that the huge investment in monuments in time of economic crisis, made by his predecessor who had just left, but with funding from the central government, will be worthwhile as it will embellish Skopje's center. "Everything which is beautiful is costly" said Todorovic to the press. He fended off criticism by saying that the government has spent money on culture but only after it has invested heavily in agriculture, education, health, raised administration salaries and so forth. He added that the Marinelli foundry had been chosen because the other candidates could not guarantee the quality. According to Dnevnik, Fonderia Artistica Ferdinando Marinelli, which was founded in 1905, has done work for the Vatican, and many countries, including the US, Poland, Hungary and so forth. The paper adds that some of the workshop's well known works include the gates at St.Paul's Cathedral in Rome, US President Eisenhower's monument in London, and the restoration of monuments at the Kremlin Palace in Moscow. At the same time Prime Minister Gruevski was answering MPs questions in parliament and said that most of the decisions concerning the monuments have been made before the economic crisis. The opposition said this was not correct. According to Dnevnik, the crisis will nevertheless delay some of the Skopje's beautification. Some of the monuments will be put on hold, including Justinian I, Karpos, St, Cyril and Methodius, St. Climent, and a few others. At his press mayor Todorovic said that works on the main square to start preparing the compound for Alexander will start soon. He should be surrounded by a fountain and a few of his fellow soldiers. Until now Alexander's monument has been criticized on cultural grounds by the opponents of the antiquisation project. Now that the substantial cost of the venture has been revealed it is possible that it would give rise to new concerns of economic nature. Last week the Macedonian Academy of Sciences and Arts (MANU), which is the highest scientific institution in the country also stepped forth with criticism for the antiquisation project. "Language is the strongest determinant of identity and our language is Slav. We have Slavic origins", said MANU's president, historian Georgi Stardelov.